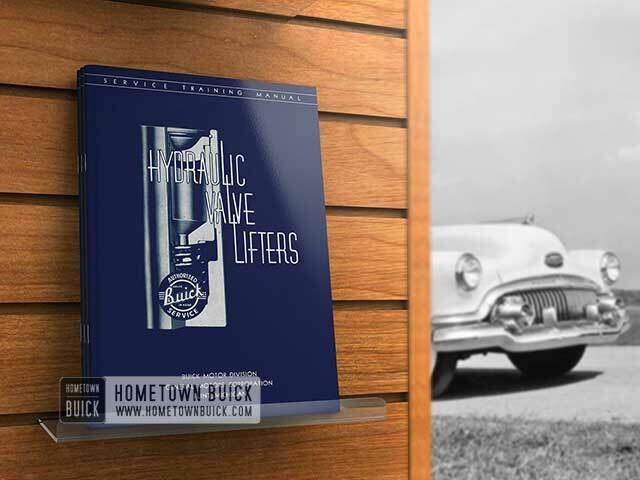 The type of solvent required for 1951 Buick Hydraulic Valve Lifters cleaning should be of a varnish removing nature. For ease of operation it should either dissolve the varnish accumulation on lifter parts or soften it within an hour so that it may be removed by wiping action. Gulf Motor Flush or its equivalent works very well as a solvent for this type of work. Some solvents that are very effective are also dangerous to use. For this reason discretion should be used when selecting a solvent. Always follow the manufacturer’s directions and safety precautions. Some solvents are not injurious, but all of them tend to remove the natural oils from the skin so that they will sometimes cause a rash. If rubber gloves are used, this disadvantage can be eliminated. Anyone working with these solvents should find out from the manufacturer what safety precautions should be taken and what antidotes should be used to counteract them. If the solvent is dangerous in any way, a sign should be posted in the vicinity where it is being used to inform any out­ siders of the dangers involved. Due to the fact that cleanliness is of prime importance when assembling lifters, two compartments are provided for kerosene. Lint and dust will adhere to the lifter parts prior to assembly and the best way to remove them is to dip the parts in each flush to insure cleanliness and to provide lubrication for the plunger when it is installed in the body. The Cleaning Tank and Trays, J-5093, are pro­ vided to hold the solvent and two kerosene flushes. The trays have 16 compartments, for one complete set, each of which will hold a disassembled lifter. The Lifter Body Cleaning Brush J -5099 effectively cleans the bore of the lifter body. 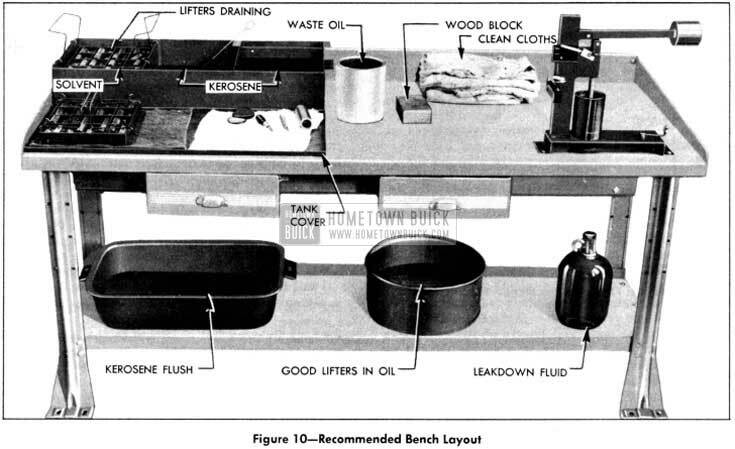 These tools are shown in Figure 10 which illustrates the recommended bench layout. A separate bench should be set up for the cleaning and handling of lifters. 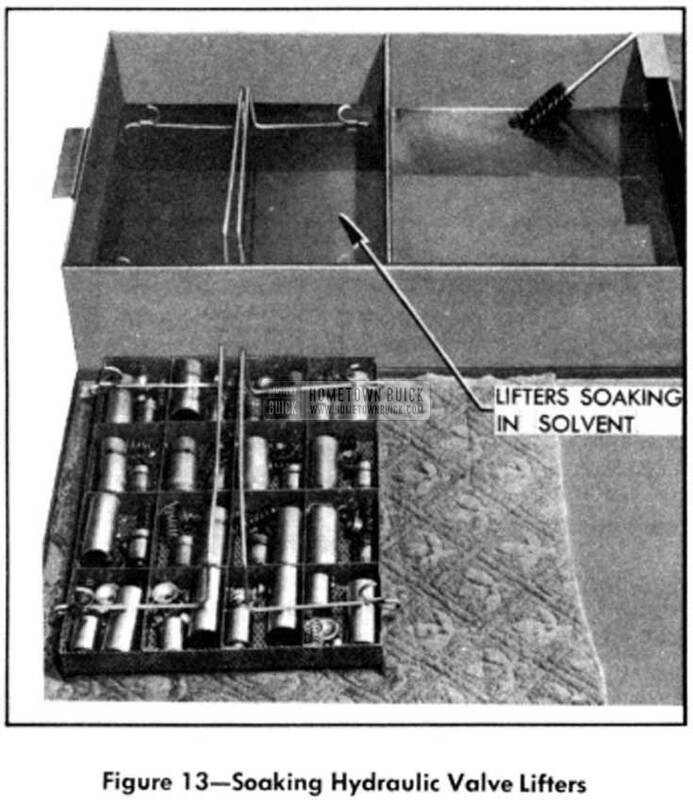 The solvent is placed in the compartment on the left hand side with the kerosene flushes in the other two compartments. Normally, 1 1/2 gallons in each compartment will last for a considerable length of time if reasonable attention is paid to cleanliness. The Plunger Depressor J -5097 has a spring loaded pin which is placed in the oil hole in the push rod seat. This pin keeps the ball from seating, allowing the plunger to be de­ pressed easily for the removal of the plunger retainer. See Figure 11. Remove the push rod seat and lifter plunger and dump oil in body into waste oil can on bench being careful not to drop the ball, ball retainer and spring into the can. 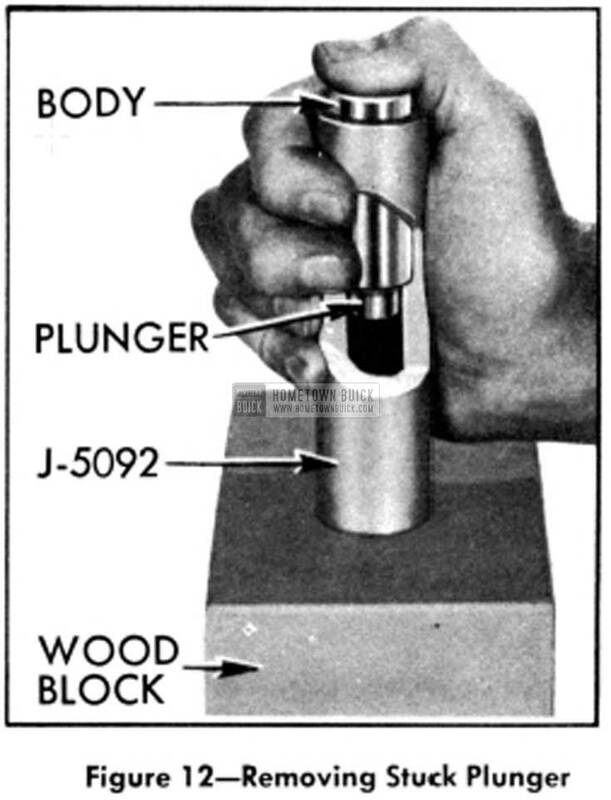 NOTE: If the plunger is stuck in the body, place the lifter in the large end of the Plunger Remover J -5092 with the bottom of the lifter out. While holding the remover, place thumb over the bottom of the lifter and rap the open end of the remover against a block of wood with just enough force to remove the plunger. See Figure 12. Place the individual lifter parts in one of the compartments in the tray. It is very important to keep component parts of a lifter together particularly the plunger and body as they are matched in production to provide the proper leakdown rate. 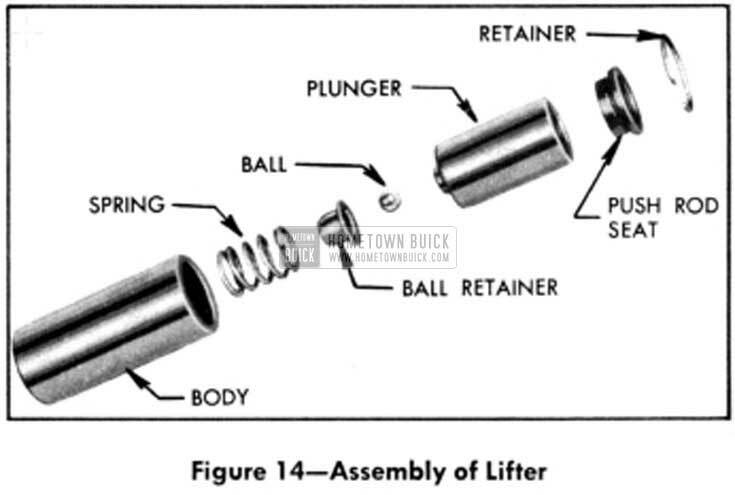 It is wise to keep the ball, ball retainer, spring and push rod seat with its plunger and body as this will assist in properly diagnosing what is wrong with each particular lifter. Repeat this procedure on each lifter until the tray is full. The following procedure will work effectively in most cases, but is somewhat dependent on the solvent used. A pan large enough to rinse a tray full of lifters in kerosene should be placed in the near vicinity of the bench. Rinse the tray full of lifters in the kerosene prior to immersing it in the solvent solution to remove as much of the oil as possible. If this is not done, the solvent will become contaminated and lose its effectiveness prematurely. Soak the tray full of lifters in the solvent for approximately one hour. The second tray is provided so that another set of lifters may be readied for the solvent while the first set is soaking. See Figure 13. Remove the tray from the solvent and suspend it on the side of the compartment using the hooks on the handles and allow solvent to drain back in order to save as much as possible. See Figure 10. Rinse the tray full of lifters in the pan full of kerosene again to cut the solvent so that it will not be harsh to the skin. Place the tray on the cleaning tank cover which should be in front of the cleaning tank. See Figure 10. Working on one lifter at a time and using clean cloths which are as lint-free as possible, wipe the lifter body internally and externally with a hard wiping action. This will remove varnish deposits which may not have been completely dissolved by the solvent. The Lifter Body Cleaning Brush J-5099 should then be used in the body bore. Cleaning with kerosene should be performed in the middle compartment of the cleaning tank. The kerosene in the right hand compartment should be kept free from lint and clean as possible for it should be used as the final rinse. Inspect lifter body as described in Section 7. Clean lifter plunger with a strong wiping action being sure to thoroughly clean the groove on the types that have them. Inspect plunger as described in Section 7 and then check the ball travel, Section 8a. Rinse lifter body in both kerosene compartments using the one on the right as the final rinse. Rinse spring in both kerosene compartments and drop it into the lifter body. Rinse ball and retainer after being sure the ball travel is within limits and drop them into lifter body. Make sure the spring is not cocked and that the ball retainer is seated on the spring right side up. Rinse plunger in both kerosene compartments and install it in lifter body. Plunger should not bind but should slide freely into body. Rinse push rod seat and plunger retainer and place push rod seat on plunger. 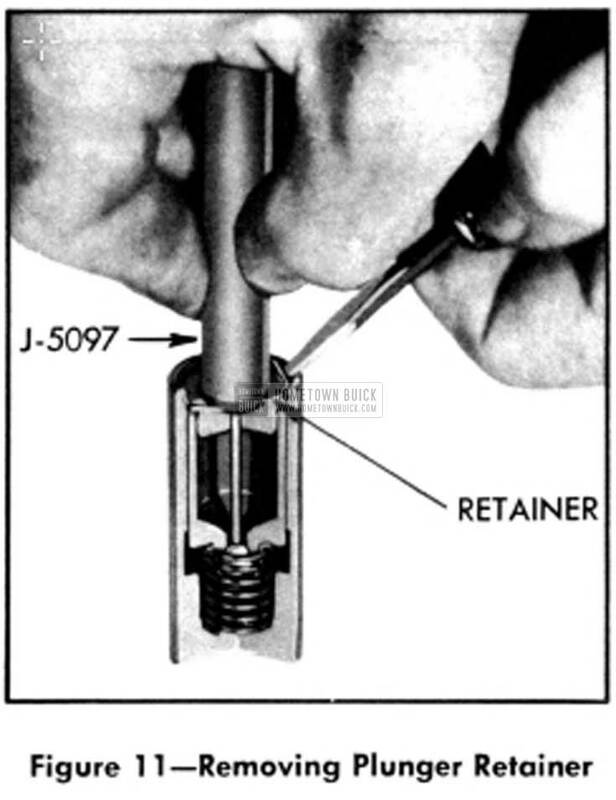 Install plunger retainer using Plunger Depressor J-5097. See Figure 13. Figure 14 illustrates the parts as they are assembled. Repeat this procedure until all the lifters in the tray are cleaned inspected and reassembled.